This yoga workout flow is perfect to start or end up your day. It’s focusing on the waistline and core and I promise you’ll get that abs if you do it regularly and eat clean. Drinking minimum 2 l a day water is also very very important for cleaning up the body. 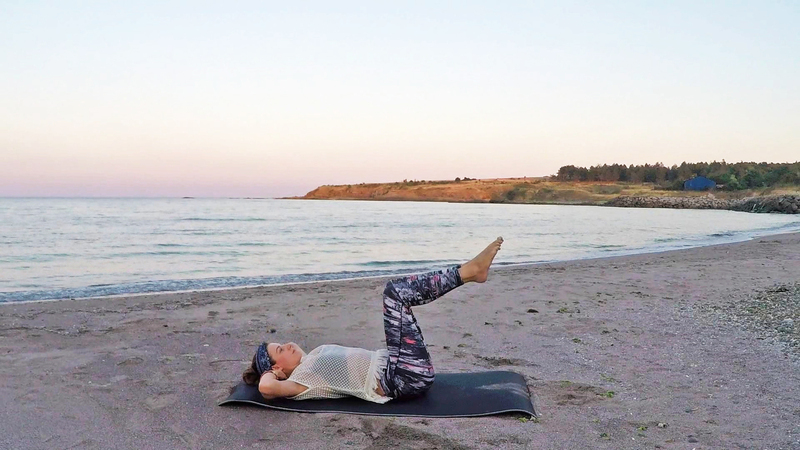 By mixing some of my favorite abs workout exercises and yoga flow, this class will make you feel so good, refreshed, re-energized and proud of yourself after finishing. This Yoga Workout for Abs & Core will get your heart rate up and boost your metabolism so you’re gonna burn more calories and fat throughout your day. The pose being Urdhva Dhanurasana also known as Upward Bow (Wheel) Pose and Full Bridge Pose. • Lie on your back with the soles of your feet on the floor, close to your sitting bones, feet hip width apart and parallel to the sides of the mat. • Place your hands on the floor just above your shoulders with fingers spread wide, finger tips pointing towards your shoulders. • Take a moment to set your foundation. Root all four corners of your feet evenly. • Activate your inner thighs so that they are energetically moving towards each other, but maintain hip width distance. • Send your arm bones (humerus) into their sockets so that you feel your shoulder blades come on to your back. Your elbows are energetically moving towards one another but remain shoulder width distance. • Press evenly into your feet and lift your hips and lower back off the mat, coming into a baby bridge. Pause. • Press into your palms evenly and lift your upper torso off the mat, bringing the crown of your head to lightly touch on the mat. • Reset your foundation (inner thighs and inner upper arms drawing towards each other, firmly rooting hands and feet) and press into your palms once again to straighten the arms and lift your head off the floor. • Let the neck be long, relaxing with gravity. Breathe. • To come out of the pose, slowly begin to bend the arms and legs, tuck the chin towards the chest, and lower your spine to the earth. Often the armpits and/or groins are tight and restrict full movement into this pose. You can support either your hands or feet on a pair of blocks to help yourself realize the full back bend. Be sure to brace the blocks against a wall, and if you like, cover them with a sticky mat to keep the hands or feet from slipping. You have to commit yourself everyday to the idea of achieving the healthy look you desire. So let’s sweat together!